In small bowl, mix mayonnaise and pesto. Spread 1 side of each bread slice with butter. Turn bread slices butter sides down; spread other sides with 1 tablespoon pesto mixture each. 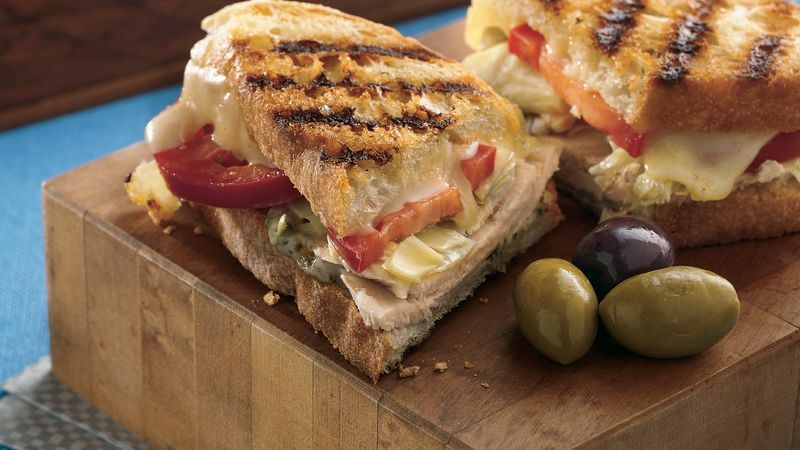 Top 8 bread slices with turkey, artichokes, tomatoes and cheese. Top with remaining bread slices, butter sides up. In sandwich grill or 12-inch skillet, cook sandwiches over medium heat 3 to 4 minutes, turning once, until bread is toasted and cheese is melted. No need to use artichoke hearts if someone doesn’t like them. The sandwiches have plenty of filling without them. Fontina cheese has a mild, nutty flavor and melts easily, making it perfect for warm sandwiches.